Comparing a series of satellite images from different periods a Californian hydrologist discovered in 1983 that a huge white spot had taken the place of the vast Kara Bogaz Gol gulf (literally “dark gullet” in Turkmen) in the south-east corner of the Caspian. The gulf had simply disappeared. Later re-appearing again. 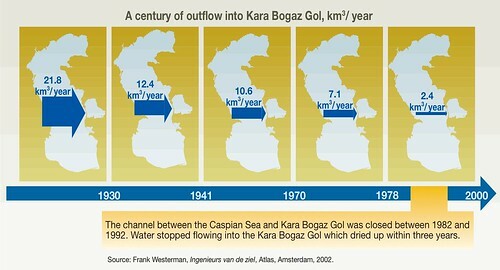 Explanations were narrated in various tales and legends nevertheless the water volume of the bay fluctuates seasonally with the Caspian Sea; at times it becomes a large bay of the Caspian Sea, while at other times its water level drops drastically.